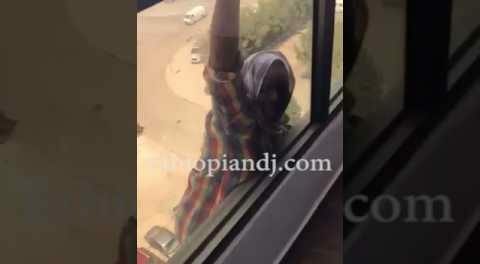 NY POST – A terrified maid pleaded for help as she dangled from a seven-story building, but her employer just filmed as she lost her grip and plummeted down, the shocking footage shows. The Ethiopian worker, who survived the fall with just a broken arm, claims she was fleeing someone trying to kill her inside the apartment in Kuwait. “The lady put me in the bathroom and was about to kill me in the bathroom without anybody finding out, she would have thrown my body out like rubbish, so instead of staying there, I went to save myself and then I fell,” she said, according to local media reports. The footage shows the maid gripping the balcony and crying, “Hold me, hold me,” but her Kuwaiti boss just replies, “Crazy, come,” before the woman’s hand slips and she falls, landing on a metal awning not far from the ground. Police have since arrested the employer for not lifting a finger to help, then posting the clip on social media, the AFP reports. The boss claims she filmed the ordeal in case she was accused of killing the maid, according to the Independent. The oil-rich Gulf state is home to some 600,000 foreign domestic workers, mostly from Asia and Africa, and accusations of abuse at the hands of employers are common.